I was watching an episode of the new version of Carl Sagan’s iconic Cosmos series the other day and they came up with the interesting fact that the space shuttle required as much thrust to escape Earth’s gravity as ten Airbus A380s. That pretty much feels like the amount of effort it takes me to go travelling sometimes. Some people are born travellers but I’m not one of them. I have spent years investing in a nice, comfortable home not realising that that comfort comes with its own gravitational field and one that can be just as hard to escape as the one holding us to the Earth. It sometimes just feels like it is all far too much hassle. Planning a trip is a time-consuming and complex process, especially if I’m moving around. What to fit in and leave out. Alternative plans for when the weather is poor. How long should I spend at each place on my list, even although I’ve never been there before. Photography adds its own challenges: when to go to each location to get the best light for a given shot. Of course the solution is simply to either take a package tour – and go on someone else’s idea of my dream trip – or pay an agency to tailor a trip for me – and suffer the financial consequences. But no, as comfortable as sitting back and letting someone else do the work sounds, it is important that I do it myself. Four years later on, I still see this lion, apparently whacked out on Scooby snacks, as I believe the young people would say. 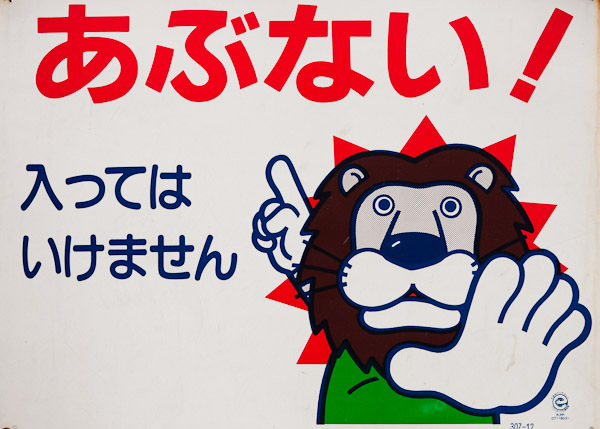 Oh, it reads “abunai, haitteikemasen” or “Danger, you must not enter”. For a start, it is part of the process and makes the sense of achievement so much greater. 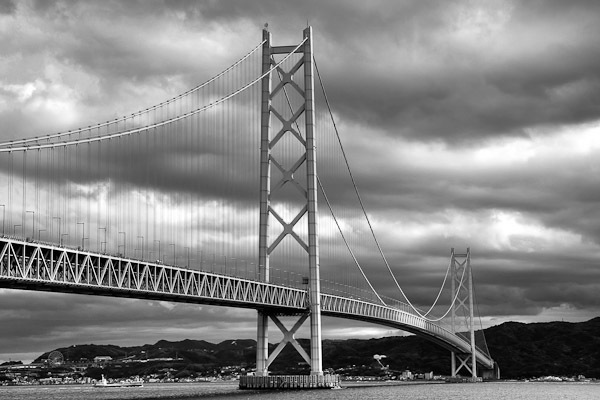 When I was in Kobe, Japan, I discovered a tour that took you up the Akashi Kaikyo Bridge – the World’s longest suspension bridge and one metre longer than originally designed due to the 1994 Kobe earthquake. The website was in Japanese, the application form was in Japanese, the tour was in Japanese and the requirement was that you understand it as the safety instructions were in, well, Japanese. So I spent weeks memorising Japanese vocabulary related to safety instructions. Weeks. But I booked the tour, was accepted and had a thoroughly brilliant, if geeky, time. But the feeling of all that hard work paying off is probably what made that tour so enjoyable – and rivals the actual experience of standing atop one of the suspension towers – an experience few will have. Second, it’s amazing what you discover as you research – things that you’d never have thought of. For example, I photograph street art – graffiti especially – and as I was hunting around for graffiti in Jerusalem for the forthcoming trip to Israel, I had a bit of a Google. Now, as ephemeral as graffiti is, good examples tend to stick around. To my surprise I found some. Some of Banksy’s work. In Palestine – the West Bank to be precise. So a big detour in my planning this weekend has been to look into travel to the West Bank. Without the planning and research, I’d have missed the whole thing. Many of you have a passion about something, so you know what I’m talking about when I say that having a passion can be far from easy. It demands time even when you don’t have the time to give. It demands energy, even when the ‘daily grind’ has drained you. And it will always throw you up against a brick wall with no apparent way of getting around. But, of course, it is that same passion that gets you through the day, the hard times, the long evenings away from home in faceless hotels (yes, that last bit is me). At some point we will all become too old to do what we love. At that point we will all have to face the same demon: regret. We will all look back at all the opportunities that we didn’t take. For me it will be regret at not seeing as much as the World’s great wildernesses with my own two eyes as possible before it is too late. In twenty years time there may not be a Salar de Uyuni, or an ice-covered Arctic. If I want to see them it has to be ‘now’, not ‘tomorrow’. For you there will be other goals, but the feelings of regret will be the same. Work is tiring, friends and family need attention and comfort’s gravity is a strong and powerful force, but passion is that personal space shuttle that allows us to break free of comfort’s gravity and escape the black hole of regret. Humble Pie at 40,000 Feet. There’s a running joke in the office about my feelings over budget airline EasyJet. I’ll make no bones about the fact that I am most definitely a British Airways fanboy. I like their up-front costs, I like their liberal carry-on policy and have yet to have a bad experience with their cabin crew. So when I perhaps overstated my dislike of having to travel with EasyJet when flying back from Aberdeen on business, the reaction was duly noted and now comes up whenever the conversation turns to air travel. In truth, there is no reason for me to dislike EasyJet at all. They are a budget airline like many others and certainly better than some I can mention. Indeed, since the aforementioned Aberdeen trip incident, I’ve used them a couple of times, both domestic and international. Whilst they don’t rank alongside British Airways, they are catering for a different market. And, to be perfectly frank, now that I think about it, the ‘paying for what you use’ model does have its attractions. Still, I would not go so far as to say that they are my preferred carrier. So when I had to sit down today and book flights for the forthcoming trip to Israel, you can imagine that British Airways was first on my search list. I’m pretty liberal when spending my own money – it is my choice as to whether I pay extra for comfort – but when spending other people’s money I have to be more conservative and British Airway’s prices fell well outside ‘reasonable expenditure’, especially as there is no customer paying for this trip. It also struck me that they didn’t have much in the way of non-stop options with the majority of flights being via a stopover in Madrid, adding ten hours to the total time. Israel’s own El Al was next. Whilst cheaper they did have some odd options for flight times. Given that the course I am attending starts Sunday morning, El Al only had two options: Fly Saturday evening at 10:40 PM – meaning arriving on the day of the course at 5:30 AM, or fly Friday morning at 9:40 AM – meaning a 4AM start. And then there was the added oddity that I had to fly out Luton, way out to the north of London, but fly back in to Gatwick, to the south, meaning that I couldn’t drive to the airport. The final nail in that particular coffin was the carry-on restrictions: Whilst they have the maximum of 55cm by 45cm by 25cm, they limit you to 8Kg – heavier than that it needs to go in the hold. My camera gear comes in nearer 12Kg – and they’d have to prise it out of my cold, dead hands before it goes anywhere near the hold of an aircraft. So it was that I found myself on EasyJet’s web site entering the travel details when a curious thing happened. They had a direct flight on Saturday at a reasonable time – 12:25 PM. They had a reasonable price, even after adding the surcharges for hold luggage and seating and most bizarrely of all, their carry on weight limit is defined as “as much as you can safely lift above your head”. They do have a ‘guaranteed carry on size” of 50cm by 40cm by 20cm, but there are a couple of ways that you can increase this to the maximum – one of which is by simply booking extra-legroom seats. As, for a five hour flight, that is a no-brainer in any event, it looks as if my precious carry-on will be safe. So the flights to Tel Aviv are booked. With EasyJet. I’ve mentioned before that I’m not a fan of organised trips. I’ve been on some pretty poor ones in the past and have learnt to avoid them where possible. Tours succeed or fail depending upon the passion and knowledge of the guide and so finding a good one is essential. It is also very tricky when visiting somewhere for the first time. That said, sometimes you simply cannot avoid them, either because the area is otherwise inaccessible or simply too dangerous without expert local knowledge. Whilst Iceland is ostensibly one of the safest countries to visit there are things you probably don’t want to attempt as a solo activity: In my case its walking on Vatnajökull, Europe’s largest glacier and one that covers approximately eight percent of Iceland. Glaciers are unforgiving: You need specialist equipment to have any chance of traversing them successfully and the rugged terrain is full of hidden surprises, such as crevasses lurking a few centimetres under apparently solid ground. When I was walking the Great Wild Wall in China I was warned not to travel alone as a sprained ankle would render me immobile and it could be days before I saw someone else. On a glacier, you wouldn’t have days; a single night would likely be enough to be the end of you. So, I’ve just signed up with ExtermeIceland’s full day glacial hike. They come with excellent credentials, if Internet reviews are to be believed. Of course, everyone who signs up for a tour has their own reasons for doing so and mine is photography. Just like yours, I suspect. Their tour is not explicitly billed as a photographic tour, although I’m guessing that it would be crazy to not assume that anyone taking the time to go on a glacial hike will want to spend some time taking photographs. As I have always found blogs a great source of information for travel, I’ll be doing my bit to contribute by offering a review of their tour from the photographer’s point-of-view upon my return.